The first Qatar Visa Center was opened at the Sentra Super City in Rajagiriya, Kotte yesterday. The opening of this center in Colombo is the first of 20 centers that to be opened in eight countries in the next few months. Colombo was chosen to open the first Qatar Visa Center considering the excellent relations existing between our two friendly countries, Qatar's Ambassador Dr. Rashid bin Shafea Al-Marri said. He said the center will facilitate and speed up procedures of recruiting expatriate workers, protecting their rights, documenting employment contracts in Qatar and speeding up his work immediately upon his entry into Qatar. 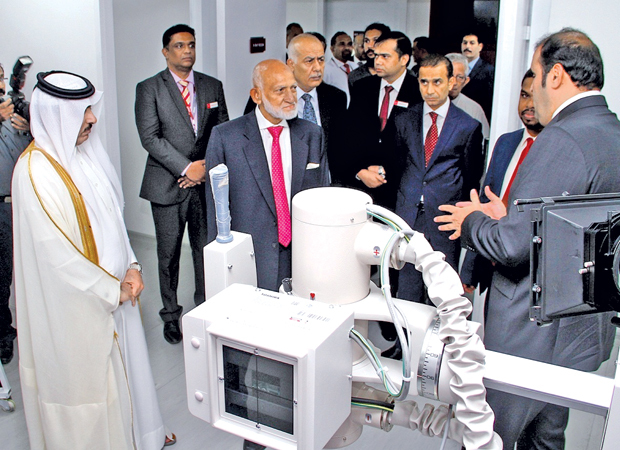 “This center will operate conforming to international standards and will be monitored by the concerned authorities in the State of Qatar”, he said. From today, work visa applicants to the state of Qatar will be required to enroll their biometric data, sign work contracts and undergo medical tests at the Qatar Visa Center. The move to get work visa applicants to complete the most essential part of their visa process in the country of origin is aimed at guaranteeing employees their rights in a manner consistent with the best international standards. The Ambassador said that in the framework of the ongoing cooperation between Qatar and Sri Lanka will strengthen the friendly relations between the two countries. “This initiative, which is the first of 20 others aims to facilitate work visa procedures for Sri Lankans migrating to Qatar and also to preserve and protect their rights through the application of best practices and international standards”, he said. Qatar's Interior Ministry Visa Support Services Director Major Abdullah Khalifa Al Mohannadi said that medical examinations, biometric data enrollment and the signing process of employment contracts for those migrating to Qatar will be done through the Qatar Visa Centers in the expatriate country of origin. He further said that this reflects the extent of Qatar’s endeavors to ensure the protection and safety of expatriates under simplified and effective recruitment process.